Craving chocolate chip or chocolate almond cookies? This cookie recipe creates a new twist on your classic American chocolate chip cookies. Forget the all-purpose flour, brown sugar, and semi-sweet chocolate chips. Instead, opt for these sugar-free soft-baked chocolate cookies with ingredients like cacao, monk fruit, and MCTs. They’re packed with so many nutrients, it’s hard to even think of this as a cookie recipe. But the taste will have you fooled. 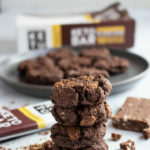 These almond chocolate chunk cookies are as delicious as they are nutritious, with a cookie dough that incorporates Perfect Keto Bars for extra flavor and a killer texture. These are truly one of the best cookies you can make when living a low-carb lifestyle. Did you know that science supports the theory that chocolate consumption may be good for your heart? It sounds too good to be true, but the studies don’t lie[*]. Cacao is exceptionally rich in antioxidants, and these specific antioxidants (polyphenols), exhibit some amazing heart-boosting properties. One marker of heart disease is high cholesterol, specifically oxidized, small particle LDL cholesterol. As opposed to larger, non-oxidized LDL that floats around in your bloodstream minding its own business, oxidized LDL is more likely to lodge into the sides of your arteries and contribute to atherogenic plaques which can lead to heart disease. When researchers gave a group of hypercholesterolemic rabbits polyphenols from cacao, the number of oxidized LDL decreased significantly. Antioxidants work by quenching free radicals and fighting oxidation. By enhancing the rabbit’s army of oxidation fighters, the risk of heart disease was decreased[*]. Polyphenols in cacao protect your heart in a variety of ways. They can enhance the function of your cardiovascular system by increasing signaling between cells and also decrease blood clotting[*]. This recipe also calls for eggs — one of the most debated foods out there when it comes to heart health. Many people avoid eggs because they think that eating eggs can increase cholesterol. But there are several flaws in this assumption and researchers have found that eating eggs may actually increase your good cholesterol[*]. Aside from the stellar macronutrient profile; 15 grams of good fats, 5 grams of protein, and only 3 grams net carbs, these almond chocolate chunk cookies have some other antidiabetic properties worth mentioning. Monk fruit is a sweetener that’s a godsend for anyone with blood sugar issues. It gives your food the sweet taste you desire, but none of the blood sugar drama that comes along with eating sugar. Part of the pathology of diabetes is excessive oxidative stress affecting the cells of your pancreas, caused by glucose (from carbs and sugar). Monk fruit, on the other hand, is an antioxidant that reduces the amount of oxidative stress in your body and also regulates the expressions of genes responsible for glucose metabolism[*]. Magnesium from almonds also helps regulate blood sugar, especially in diabetics[*]. Increasing magnesium supplementation may improve insulin sensitivity in people with magnesium deficiency. When researchers gave a group of magnesium-deficient people a magnesium supplement, the subjects showed increased sensitivity and enhanced ability to manage blood glucose[*]. Looking for an afternoon pick me up? The MCTs (medium chain triglycerides) in the keto bars are more than just a keto-friendly fat source; your body absorbs MCTs easily and converts them to energy without storing them as fat. Long chain fatty acids have to make a journey through your lymph before making it to your cells to be used as a source of fuel. This is why no one uses high-fat foods as a quick energy source. MCTs, unlike long chain fatty acids, are absorbed directly by your blood and are rapidly transported to your liver to be used for energy[*]. Consumption of medium chain triglycerides can even enhance ketone production, which may help you get into, or stay in, ketosis[*]. Another energy-boosting ingredient in these almond chocolate chunk cookies are the eggs. Eggs are rich in B vitamins, and B vitamins play an essential role in energy metabolism[*]. B12 is of particular interest when it comes to energy metabolism, as B12 deficiency is related to significant drops in energy. In a review of vitamins and minerals and their effect on physical performance, B12 deficiency reduced endurance and work performance[*]. It’s time to pull out the cookie sheet and whip up a batch of these soft and chewy almond chocolate chunk cookies. With a dark chocolate, nutty flavor, these are some of the best cookies you can make that also contain a slew of nutrients and healthy fats. Add some nut butter or peanut butter for a nutty twist — these cookies are as versatile as they are satisfying. You can even top them with some keto ice cream if you really want to treat yourself. Gluten-free, sugar-free, and keto-friendly, what else could you want? This new recipe for soft-baked almond chocolate chunk cookies is your gluten-free and sugar-free alternative to chocolate chip or almond cookies. Add butter, extracts, and sweetener to a large bowl or stand mixer. Mix on high for 2-3 minutes until light and fluffy. Slowly add dry ingredients to wet ingredients. Mix just until well combined. Remove Perfect Keto bar from wrapper and cut into small pieces. Add to your cookie dough and stir until evenly distributed. Divide and scoop dough balls onto your prepared baking sheet. Sprinkle on sliced almonds if desired. Bake for 8 minutes, just until firm on the outside. Let cool slightly on wire rack, and enjoy.